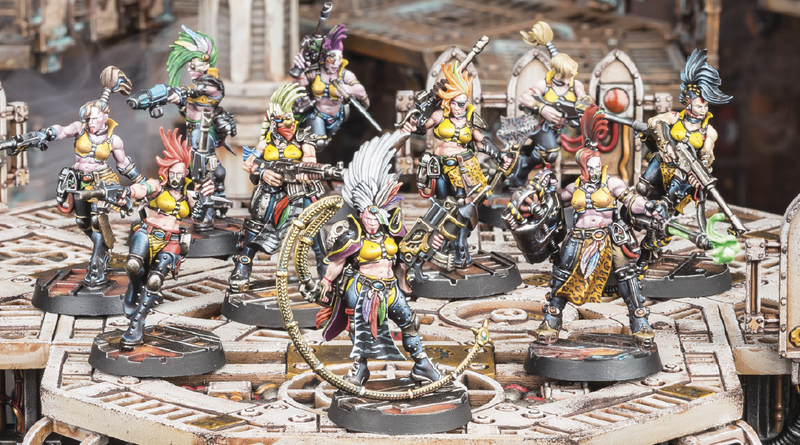 I’ve not been able to talk much about the hype around the return of Necromunda on my blog yet, as I’ve been in the middle of moving house and stuff, so haven’t had a proper amount of time to digest the news we’ve seen from GW about it. However, I’ve been gorging myself on this stuff today, and I have to say, I’m incredibly excited to get my greasy paws on this box when it arrives in November! 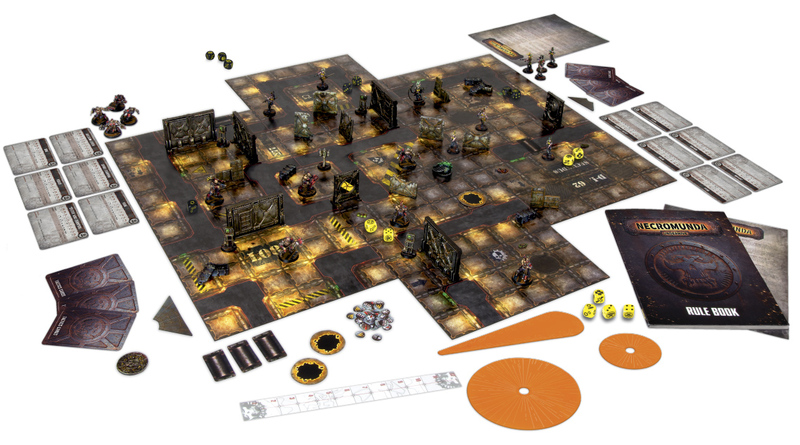 I wasn’t around for the original Necromunda, which was out in 1995. I mean, I was alive, but I was much more interested in fantasy than 40k at the time. Anyway! 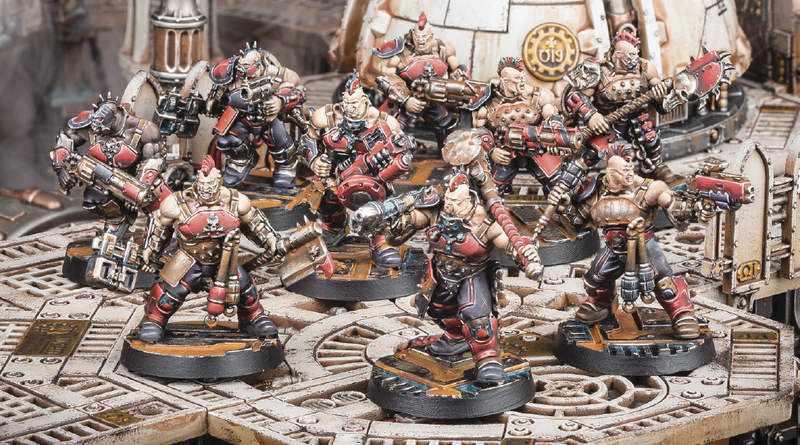 This time around, it looks like GW have applied all of the style and panache of their recent sculpting success into the gangs we get in the box, to bring us (what looks like) twenty wonderfully individual miniatures that would look great on the tabletop. While I’m excited for the game, I’m excited for the miniatures and find myself hoping that we’ll be able to use them, in some way, in 40k at large, as well. At any rate, they should provide some amazing conversion-fodder! I’ve already been thinking about the potential for House Escher as Wyches in my Dark Eldar army! The sculpts look amazing, but I find myself less than enthused about the paint jobs on the minis we’ve seen so far. The purply skin tones seem to clash terribly with the yellow on the Escher minis, although I love the weapons options, and I’m really impressed by the look of them as a gang. House Goliath minis look somehow weirdly washed-out with the faintly rust-orange thing going on all over there, but even so, they look like solid sculpts that I’m finding myself looking forward to painting up just as much! Each of these gangs will be multi-part plastic kits, and I’m so happy about this! It sounds like this game is going to be more like Betrayal at Calth rather than Deathwatch Overkill, and we’ll eventually get the sprues for each available separately without any need for them to re-tool the sculpts. I love getting individuality from models through the assembly, so this is definitely something to look forward to. Forge World are also set to do upgrade kits, which sounds like there could really be quite the industry coming out of this game! Not that there would really have been any doubt about its popularity, surely…? While the game is coming with just two gangs, I really hope we get more options soon for more variety. News from the recent NOVA open indicates that we’re getting a lot of support for the game – Adeptus Arbites, welcome back! The board seems a bit flat, especially when you consider that the original game was all about the multi-level experience. 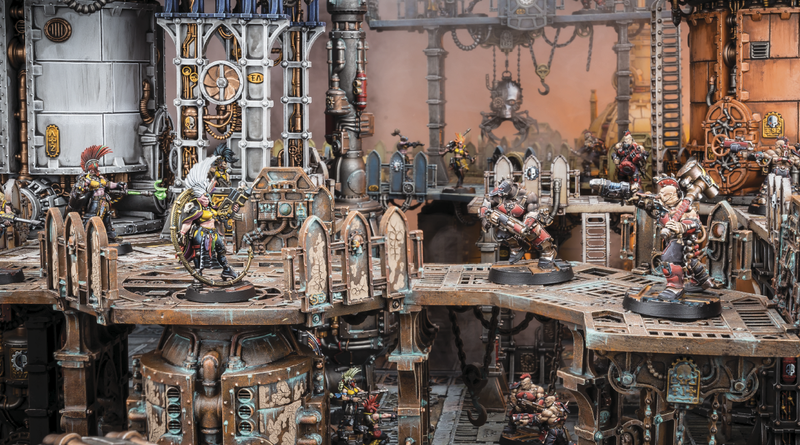 However, as the article from whence I’ve been plundering all of these pictures explains, there will also be rules for us to enjoy the game amid the Sector Mechanicus terrain sets, which makes me glad I picked up the entire range earlier this summer! I’m hugely looking forward to getting hold of this game when it comes out. I’m hoping that GW don’t drop the ball and make it some kind of limited-run thing like the original Shadow War Armageddon box – hopefully, its release in November means that it is taking the place of the Horus Heresy boxed game that we’ve had over the last couple of years, and so will be available for a long time yet. Though of course, I imagine that initial take-up is going to be phenomenal.